« Batteries: Why So Many Sizes? If you’re anything like me, you know somewhere in the back of your head that tea is healthy for you. The mention of tea evokes vague thoughts of “antioxidants” and “caffeine.” But where does it come from, what’s in it, and how do all the colors of tea relate? To begin with, most tea comes from the Camellia sinensis plant. Green, white, black, and oolong (our first topics in the series) are all different preparations of the same species of plant. We will also be covering red tea and herbal tea, which do not exclusively consist of C. sinensis. Tea and its word come from China, where the character representing tea is commonly pronounced tê. 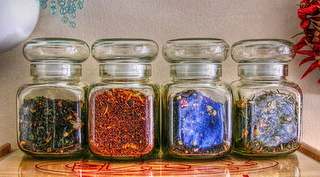 Worldwide, most variations have settled into a form of te/tee/tea or cha/chai/tsai. Ergo, “chai tea” can be considered redundant! In tea cultivation, the top one to two inches of the mature plant are buds and leaves called flushes. It is only this part of the plant that is picked, and a new flush will grow every seven to ten days through the growing season. A tea’s type is determined by its processing. Leaves of C. sinensis begin to wilt and oxidize if not dried quickly after picking. Their chlorophyll breaks down, tannins are released, and the leaves turn progressively darker until they are heated – which deactivates the enzymes responsible for the oxidation. Next to water, tea is the most popular drink in the world. With so many varieties, so many ways to drink it, and and so many health benefits, it’s easy to understand why. Join me on this journey through some of the major varieties of tea to learn more about this comforting brew. Comment if you have any specific questions that I can address along the way!